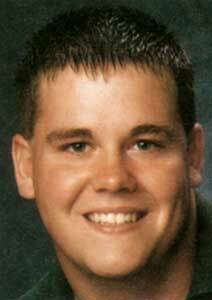 Michael Wayne Anderson, 29, Paola, died Saturday, Dec. 13, 2008, after an automobile accident in Miami County. He was born Sept. 24, 1979, in Kansas City, Kan., to LeRoy and Renie LeBow Anderson. He graduated from Osawatomie High School in 1998. During high school he worked for Brewer Automotive. On June 16, 2001, he married Jamie Winegar in Osawatomie, and they moved to Paola in 2002. He became a foreman with the Capital Electric Contracting Company, where he was employed for 10 years. He enjoyed riding motorcycles, four-wheelers, boating, hunting, fishing, the outdoors and spending time with family and friends. He was a member of IBEW Local No. 53 of Kansas City. He was preceded in death by a sister, Mandy LeBow. Survivors are his wife, Jamie of the home; two sons, Layne and Luke; his father, LeRoy Anderson of Kansas City, Kan.; mother, Renie Anderson of Kansas City, Kan.; brothers, LeRoy Anderson Jr. and Brian Anderson, both of Kansas City, Kan.; and sisters, Cheryl Buck of Belton, Mo. and Christy Anderson of Kansas City, Kan. He will be greatly missed by family and friends. Cremation. A memorial service will be at 1:30 p.m. Thursday at Penwell-Gabel Paola Chapel, 305 N. Pearl St., Paola, KS 66071, (913) 294-2372. Burial will be in Osawatomie Cemetery. To leave condolences, go to www.penwellgabel.com. Memorials may be made to the Layne and Luke Anderson Educational Fund.